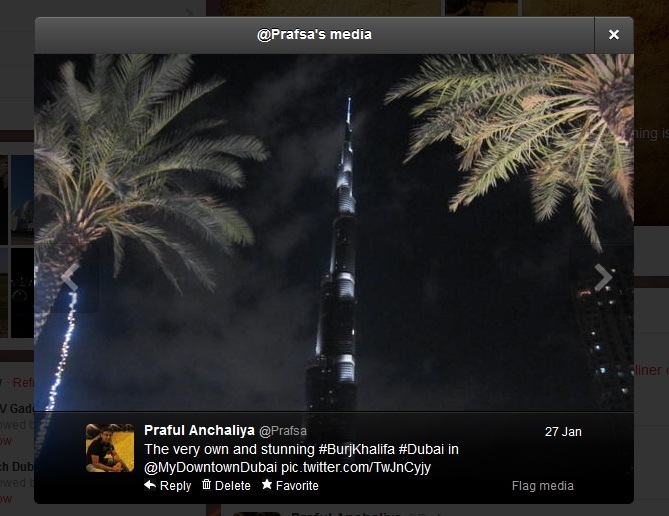 January 2013 – Tales by a Socialite! Twitter, today, has announced a new fresh outlook to it’s media. Yes, the traditional, slow format has been converted to something similar to picasa on your PC/Mac. It has begun rolling out a new feature that will let you view a larger version of a photo without going to a separate page (as pictured below), as well as another addition that will see videos from Vine, YouTube, Vimeo and others video engines. Just a quick question on this subject: Can it be controlled? Recent example: “Dreamliner” Boeing 787 – one of the finest state-of-the-art airplanes being grounded due to some incidents and faults. People got to read all sorts of stuff on Social Media platforms. One who knows nothing about Airplanes; also killed it on his/her account. Question rises again; can Boeing do anything about it? Very similar to this one, there are a lot of other examples also; since we all are smart enough to know that by now; Social Media agencies are hired to do all sorts of Social Media for big conglomerates, accidents like these are well anticipated. This is what we call a “Social Media ‘Fail'” or to tag it #SocialMedia #Fail. What’s the your strategy for these times? – If you don’t have one; have one. If you have one; review the other top Social Media fails and analyze your’s. What’s the best that could be done? Well, it totally depends upon the gravity of the situation. If it is a minor and recoverable incident, best is to keep calm and quiet for a while because ‘Justin Beiber’ or ‘One Direction’ would come soon to rescue you. Yes this is how, your audience is now-a-days.If you are not following: just keep a track of the top 10 world trends on twitter for 7 days and you’ll know what am I talking about. But if the situation is worse; make an apology on be half of the chair and try to minimize your damage according to your business model but only if it’s affecting to an extent where you cannot afford. And if it’s unrecoverable; better stay quiet and continue in your fashion of your business model and pretend it never happened and in a jiffy it would be wiped off. It is one of the simplest answer to any SM Failure which usually are seen these days. Small advice: Don’t engage while the rage is on; no matter how big you are; you’ll go down. Why was it viral in the first place? Do you know anything about human psychology? It reforms every second we see something. And who doesn’t know about “Key Influencers?”. I might be scared to put something on my account first but just a quick moment where I see an influencer’s post/tweet; bingo, shared! Literally, no one. Because not only they are difficult to track but also impossible to eradicate. So either don’t let them happen or stay put for the next big thing. A spectacular experience in Downtown Dubai today. Yes, I proudly call it, My Downtown Dubai. It was the world’s tallest building lit up like a fire-bird from heaven; showering blessings on the entire city. Video to follow! Wishing you and your families a very happy and prosperous new year. May 2013 brings peace and wealth to all who deserve.